On 4th August 2018, 40-50 residents of the Hindu College Hostel staged a strike to protest against the recurrent hike in the yearly fee. The students demand a decrement in the yearly fee, or they wish to see tangible benefits in the living conditions of the hostel. During the first week of August, the students residing in the hostel of Hindu College staged a protest against the recurrent hike in the yearly fee of the hostel. The protest was in the form of a strike, which began at 9 a.m. on the 4th of August, according to the sources who participated in the protest. As per the sources, the students who are vehemently against the fee hike settled themselves outside the hostel, in order to peacefully get their concerns heard and resolved by the authorities. 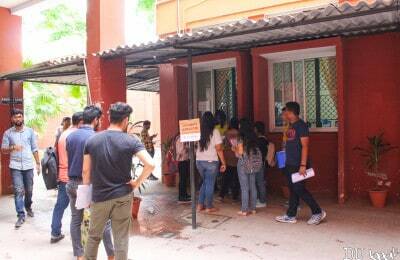 After protesting in front of the hostel gates, the crowd went outside the Principal’s office. The sources have revealed that the Principal, Dr. Anju Srivastava, readily listened to the issues the students were fighting against. Inputs from numerous residents of the Hindu College’s hostel can be used to understand that the 40-50 students who sat for the strike are in opposition of the lack of transparency in the monetary matters. A student, on the condition of anonymity, told DU Beat that the ceilings and the ‘renovations’ in the hostel could be used as a clear evidence of the dearth of justification for the fee hike. The students are appalled by the yearly increment in the fee, when there have been no improvements whatsoever, in the way the students were housed. The sources conferred that the yearly fee, for the first-year resident students, has increased from an approximate of INR 51,000 to INR 70,000 within a duration of three years (2016-2018). A collaborative account of the protesters inferred that the yearly increment in the fee has been attributed to the government’s policies pertaining to the workers’ daily wages. Since the policies are revised on a regular basis, it allegedly becomes inevitable for the authorities to adjust the residents’ fee accordingly. On the condition of anonymity, a source revealed that despite the allocation of a yearly fund of INR 62 lakhs by the University Grants Commission, the hostel runs into a deficit almost every year. There had been a surplus amount on certain occasions, a few years back, and the authorities had hired more workers. The reasons behind the hiring remain unclear and the students have no idea as to why the hostel must employ two managers in one mess, unusual for any college hostel. To resolve the mentioned issues, the source claimed that the students met with the warden and both the parties have been thinking of possible ways to accommodate the extra workers, four to five in number, instead of terminating them. The students think that the surplus hiring occurred in order to please certain groups or individuals. The clear explanation or understanding for this has not been provided to the students. A meeting will take place on 13th or 14th August, where the Hostel Managing Committee and the Principal would attempt to meet the student’s demands- to either reduce the fee or to justify the hike by showing tangible results in the hostel’s conditions.